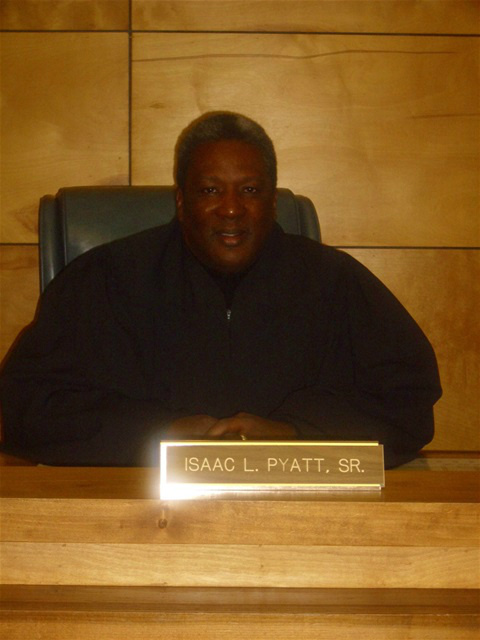 Judge Pyatt has been on the bench for almost 20 years now. Before that, he was in law enforcement for almost 15 years. I really enjoyed this sit-down with him and even learned something from it. I had been told many times, if you want to serve as Magistrate, you need to be elected yet, I never saw anyone’s name, let alone the position on any of the voter’s ballots. Someone who’s never voted probably told me that. However it left me wondering, how does the common citizen learn enough about the law to be able to rule accurately enough in order to be a Magistrate judge? “We’re appointed to the bench,” Judge Pyatt answered. “In my case it was Huey Walker who approached me and then made nomination on my behalf,” he answered (Huey Walker was Pyatt’s predecessor). We talked a little about his personal life; he’s married to Comeletia Pyatt; an educator and has three grown children - two boys, one daughter. His eyes lit up with pride as he talked about his wife and his children, all of whom are very successful in their lives. Personally, I’ve had to go before Judge Pyatt before. I realized he’s a pretty fair judge during that time. I may not have liked his ruling, but he was fair and impartial and that was good enough for me. “Sometimes people just want to be heard,” Judge Pyatt expressed about many of his cases. “What did you do about it?” I asked as a follow up. Georgetown is lucky to have Judge Pyatt. He enjoys his work, he’s thorough and dedicated. He presides over civil cases and a few criminal cases with a strong sturdy gavel.